Jeanne Dietsch began her entrepreneurial career at age 29 as president of a market research venture co-owned with Pat McGovern of IDG. After selling that start-up, Dietsch started her second company by publishing the very first e-commerce market survey of all 1,100 companies then listed in Yahoo. ActivMedia Research became a leading authority on e-commerce, used by Sprint, Verisign and many others. Later in 1995, Dietsch co-founded the enterprise that would become ActivMedia Robotics. For the last 8 years, her team has been gradually designing and building the complex systems underlying the autonomous programmable intelligent mobile robotic bases and control systems that are coming to the commercial marketplace for the first time in 2004. Sinclair: What new capability are you providing to building automation? Dietsch: We're giving automation the ability to move objects in space. Most facilities managers and building automation specialists think in terms of sensing and controls. Very few think of moving anything other than elevators or, possibly, doors. Our PatrolBot is a computer on wheels that can travel to wherever it is needed in a building. It offers ready-made applications for delivery, surveillance, environmental monitoring, building tours and reception. It operates autonomously, but can also accept commands and information with the rest of the enterprise through wireless Ethernet. It is programmable for custom applications, with a full API and developer utilities. Sinclair: What is the difference between PatrolBot and the mail delivery robots that have been around for decades? Dietsch: Early mail robots just followed a wire that had to be installed in the floor. Later robots used sonar and infrared range-finding devices to follow walls and corridors. 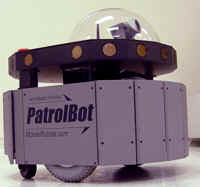 PatrolBot fuses gyroscopic, wheelshaft and laser-rangefinding data so that it knows its position in relationship to its starting point and to the building around it. Because it can make and store floor plans in its memory, it can compare its current position to its calculated position many times a second. Using statistical methods, it determines its position in relationship to walls and other permanent objects even though furniture, people, inventory and other objects around it change. This allows the robot to travel to any permitted position on the floor plan, to avoid obstacles in its way and to find alternative routes when a corridor is blocked. If walls in the building are moved, the robot can map the new layout in minutes. Sinclair: Why does an automated building need mobile robots? Dietsch: Mobile robots close the loop in building automation. Sensors can supply information about the building to the central controller. The controller can change HVAC or other systems based on that information, but how can the controller check on the sensors to see whether they're working properly? How can the controller check on conditions that may not warrant a permanent pervasive sensor network? How can we bring a human into the loop with remote vision and audio without requiring a physical presence on-site? When repairs are taking place, how can the worker collect a forgotten tool from the other end of the building without having to fetch it personally? How can we bring largely invisible automation systems to the attention of the tenant? Mobile robots embody the solution to all of these questions. For example, at Hewlett-Packard Labs, PatrolBot is being used to create 3-D models, optimize and maintain HVAC systems in the sensitive environment of a server facility. Cable companies are considering using the technology for checking cable and wireless coverage during and after installation. Pfizer Global Research is using PatrolBot to help guards monitor remote equipment. An IP-driven technology firm is considering using PatrolBot to guard its central storage area because it feels that the robot's ability to move will help intimidate people more than fixed surveillance. Robots have been used for delivery for decades, but PatrolBot no longer requires a fixed route. A maintenance person can send it one place for supplies; shipping can send it to deliver packages to a tenant; emergency crews can send in lights, emergency supplies or bio-hazard test equipment. Most importantly to some developers, robots can showcase building automation for tenants in a way that can be upgraded, bringing new capabilities to maintain a technological panache over time, for which developers can charge higher rents. Sinclair: Can't fixed sensors and cameras work as well or better than robots? Sinclair: What is the future of enterprise robots? Dietsch: In the future, PatrolBots will learn to detect events themselves in addition to responding to alerts from other sensors or people in the building. This will improve security and lower costs. As robots monitor the building environment, they may test for air-borne virus or other health hazards, and notify facilities managers. Or they might detect security violations or maintenance needs and notify the appropriate staff. Over the longer term, robots may feed data to a central knowledge bank for comparison with similar problems. If the knowledge bank reports a good match, the central controller may instruct the system to implement the likely solution. Robotic vehicles that travel both indoors and outdoors will provide both transportation and logistical support. We're already working on an autonomous wheelchair, for National Institutes of Health, that will enable people who can move just a finger or an eye to control their wheelchair's location, position it toward a window, etc..
We'll be expanding these robots so that they carrying a robotic arm let people remotely manipulate objects. Later, the robots will perceive and manipulate the objects with less direction from people. This will be of great assistance to facility operations staff who need something at the opposite end of the building, to tenants who might be too busy or unable to fetch objects themselves, to medical support or rescue staff working remotely, to SWAT teams interacting with building occupants and for other purposes that will only become apparent when the materials are available. What I would like to emphasize is that robots will not reduce the number of jobs that are available for people. Like the printing press, like the steam engine, like the computer, like the Internet, technology creates more jobs than it displaces. Yes, the computer reduced the number of typists necessary, but it created hundreds of thousands of high-paying software jobs. Likewise, enterprise robots will change the workplace, but they will create vast opportunities as they do so.